The Abo-Tani Clan Organisation ( ATCO ) threatened to launch a democratic movement if the state government is not being taken care of their demands in the greater interest of the Abo-Tani clan and state as a whole. 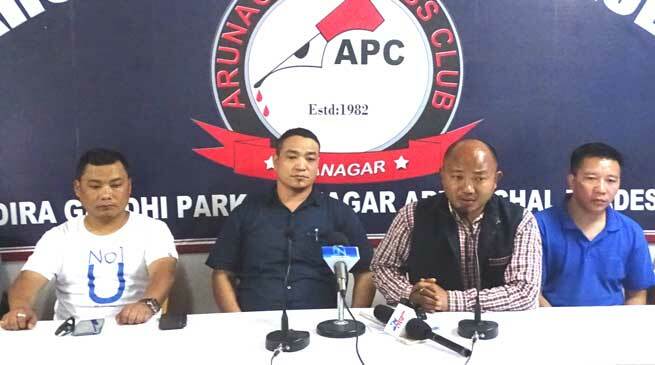 Addressing a press conference at Arunachal Press club here today ATCO Chief Advisor Taba Taku said that ” we are not against the state government for creation of Department of Tirap, Changlang & Longding, (DOTCL), Department of Karmik & Adhyarmik (CHOS-RIG) Affairs but we fled the requirement of Abo-Tani Traditon and Culture Department for all round development and promotion of art, culture and preservation of art, culture and tradition etc. We have never criticised for creating of such department but felt necessary that the major area of state which is inhabitant by the Abo-Tani clan community is left behind for its promotion of culture and preservation of art so the new Department shall cease to the demand of such activities in the central parts of the state which is being represented by more than 30 MLA out of 60 and demanded the work or its related activities need to be done within 90 days. Taku said that “there have been hearing about the construction of Greenfield airport nearby the capital complex which is still pending and the matter is lying hanging, we want the airport at any cost which ever the place is finalised since the important infrastructure and is being located in the Abo-Tani dominated area so it is an important asset of the state and nation if once constructs and demanded that the work to be immediately started and wanted activities to be started within a month. Taaku further said that there have been unequal fund distribution for the RE work for the year 2016-17. There have been discussion with the community based organisation (CBO) for the pre-budget but after the fund distribution it is seen that many schemes are been either seen in Tawang area and in Namsai area. It seems that the discussion which held were rolled out and was of no meaning and the Tani belt have still been not given due importance in compare to discussion held. He said that MLA belongs to Abo-Tani clan have been aware of all such activities of the government but could not raised the issue as they are the part of the government. They have been supporting the issue. Taku further we are not trying to draw any political conclusion as MLAs are representing the area while we represent the community. Convenor Logum Tagia while elaborated the motto of the organisation and its existence since more than ten years. He said that we have no political interest but we want out tradition culture and identity is preserved in any cost. We even don’t have any objection over influence of western culture but we want that we remain as we are apart from practicing any religion and belief.